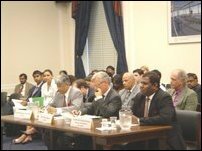 Speaking at a Members' briefing organized by the Congressional Human Rights Caucus Wednesday at the Rayburn building of the Capitol Hill Washington D.C on "Sri-Lanka: Challenges and Efforts to Effectively Deliver Humanitarian Relief in the Wake of the Tsunami," Tamil National Alliance parliamentarian Gajendrakumar urged the United States Government to "resolve any legal issues that prevent the US government from directly, equitably and expeditiously providing all forms of assistance to all parts of the Northeast," sources in Washington said. 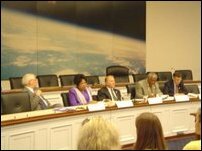 Congressman Danny K. Davis (D-IL) co-chaired the Briefing along with Rep. Steve Chabot (R-OH). Representatives Rush Holt, David Price and Diane Watson also attended the briefing. Panelists included Norwegian Ambassador Knut Vollebaek, Sri Lankan ambassador Bernard Goonetilleke, Professor Oberst, Physician Dr. Karunyan Arulanandan and officers from USAID, ICRC and International Organization of Migrants (IOM). 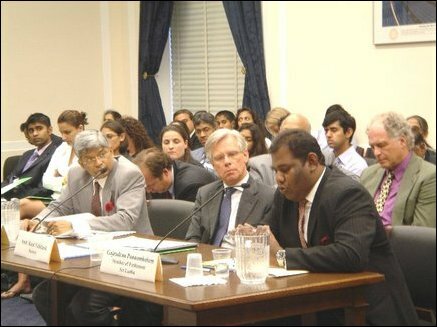 Congressman Davis in the opening statement raised the question of the right to self-determination and if this will form an important component of the eventual solution to peace in Sri Lanka. Ambassador Gunatillake said that despite difficulties from opposing groups, Sri Lanka Government is fully committed to ensuring that aid reaches the people of NorthEast. Professor Oberst said Post-Tsunami Operational Management Structure (P-TOMS) can form an important component of the Peace Process and therefore must not be allowed to fail. He said international community should support Sri Lanka's President Chandrika Kumaratunge in her efforts to implement P-TOMS. There was consensus among panelists that a mechanism should be found to allow aid to flow to NorthEast. Mark Ward of USAID said that although USAID is restricted by US laws to support rehabilitation projects in LTTE held territory, this aspect is balanced by the willingness of the European countries to work in these areas. Ambassador Vollebaek said that implementation of Joint Mechanism [P-TOMS] is imperative for equitable distribution of aid to the NorthEast. Prof Oberst, Arulanandam and Gajendrakumar agreed in their call to US Government that it should resolve the legal constraints and issues that prevent it from providing direct help to all parts of NorthEast that need post-tsunami rehabilitation assistance. Question of anti-conversion law and attack on World Vision offices, and if these would hinder aid by faith-based groups was raised by Congressman Chabot. Ambassador Gunatilleke responded that the law is being amended and the Government is making efforts to prevent religious violence. Gajendrakumar said in his statement: "...three years of the peace process provided asymmetrical consequences to the island. Whilst the predominantly Sinhala South enjoyed the peace dividends, the Tamil areas of the Northeast, the area most affected by the war, did not enjoy them." On the issue of the Supreme Court striking down provisions in P-TOMS as unconstitutional, Gajendrakumar said: "The Tamils never participated nor consented to the making of the Sri Lankan Constitutions...They do not owe their allegiance to the Sri Lankan Constitution. Indeed, the Sri Lankan constitution, which does not provide a political space for the Tamils to articulate their grievances and seek redress is the main cause for the armed conflict. Sovereignty does not reside in an abstraction called the State, but with the people. The Sinhala polity’s fidelity to its Constitution is nothing but a naked attempt to entrench the Sinhala Polity’s hegemony over the Tamils."